1. You can't use the Browse button/feature and then navigate to the network share. To specify the network share, you need to manually enter the UNC path into the Real path field as shown below. 2. Make sure your JSCAPE MFT Server service is running under an account that has access privileges to the network share. You can specify this in the JSCAPE MFT Server service Log On tab, under Local Services. By default, this will be set to the "Local System account". Change this to your desired account. 3. 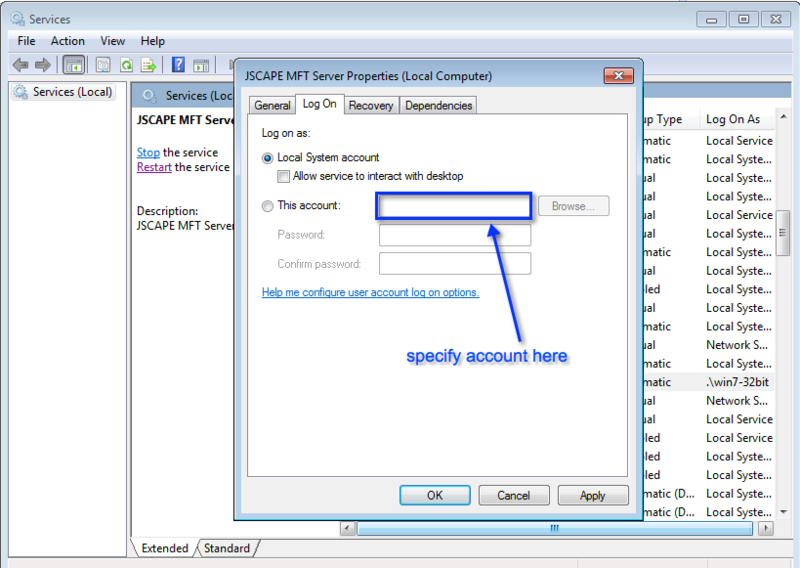 Every time you upgrade JSCAPE MFT Server, the service will revert back to the Local System account. If your JSCAPE MFT Server installation is accessing shared network resources (i.e., UNC paths) then you may need to update JSCAPE MFT Server service to use an account that has access privileges. 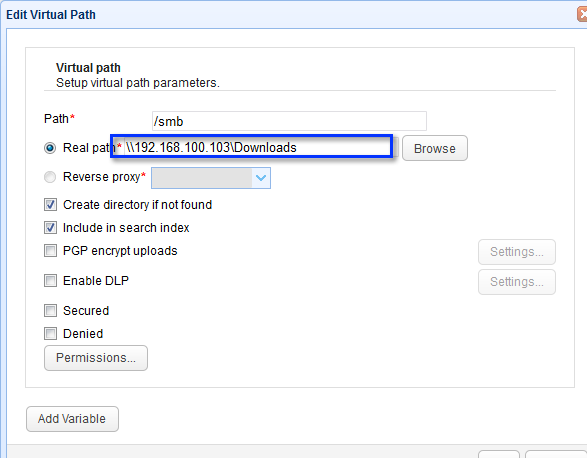 Note: If you're using the latest version of JSCAPE MFT Server, an alternative way of mapping a virtual path to a Samba share would be to set up a reverse proxy that maps to a Samba share and then mapping the virtual path to that reverse proxy. The article "Mapping FTP, FTPS, or SFTP Server User Directories To Samba Shares" shows you how to do that.